My mom asked me recently what I wanted for Christmas, and I jokingly said that as the mom of an infant, all I really want is an afternoon where I could sit on the couch in silence for a few hours. She laughed and asked if there was anything else that I wanted that might fit under the tree better. I got to thinking about it though, and it actually is the perfect gift idea – not just for me, but for any friend that would love a cozy winter day of hibernation and relaxation. I’m not cool enough to use the term Netflix and Chill, but this my friends, is definitely a Netflix and Chill kit. Here’s what I put in it in my hibernation-themed gift: Instruments of Coziness. Hibernation rule one: you must be cozy. A warm throw blanket for couch lounging is key, and a pair of the fluffiest socks available for optimal snuggling. There are so many cute holiday socks that I had trouble picking the perfect pair! A nice set of pajamas would be great to include in the kit too. Delicious Delivery. I’ve made it pretty clear that we’re not leaving the couch, right? Maybe we’ll get up to answer the door for delivery though. Even though I love to cook, I adore getting some indulgent take out on the weekends. Indian food, Italian food, or maybe just a gigantic order of French fries delivered to my door? The world is my oyster. I put a Grubhub gift card in the hibernation kit so that we’ll have plenty of rations for our day of lounging. 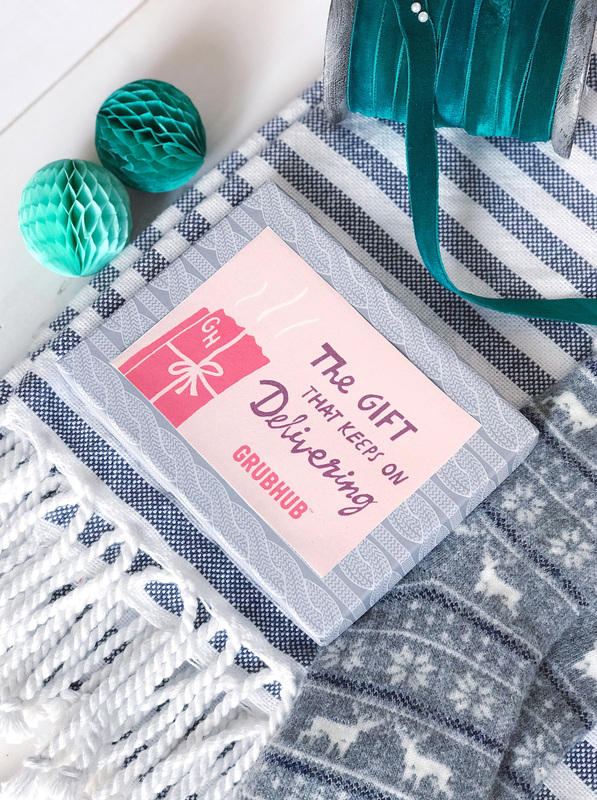 Grubhub has adorable gift card design options, and you can even upload your own photo to customize them – what about adding a photo from your favorite binge-watching TV show, or a picture of the meal from your favorite take out place? You could get real creative with these gift cards. They’re a perfect gift for all of the friends and siblings on your list that have stumped your gift-giving abilities! Entertainment. Your Netflix password might be the greatest gift you could bestow on someone, right? 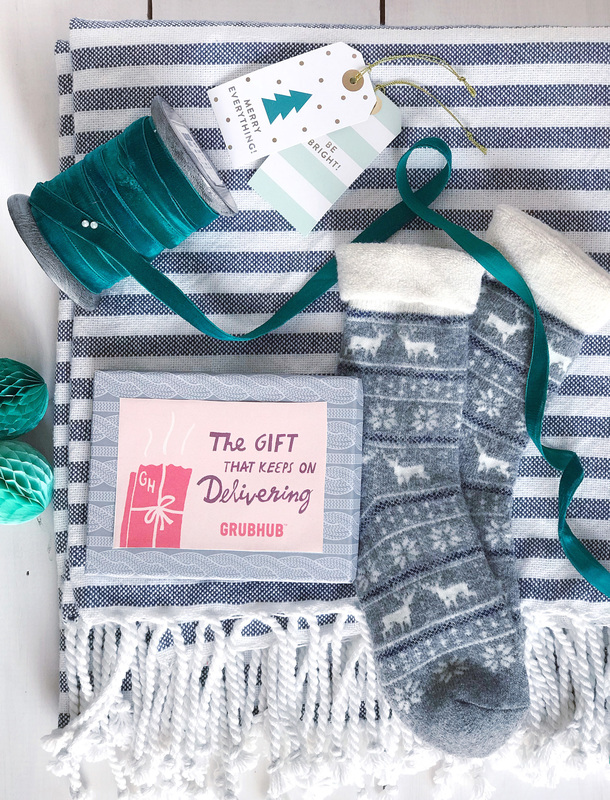 Add a holiday card with a list of binge-worthy show suggestions to your gift, and tuck in extra long iPhone charging cord so your gift recipient can scroll through social media for hours on end. 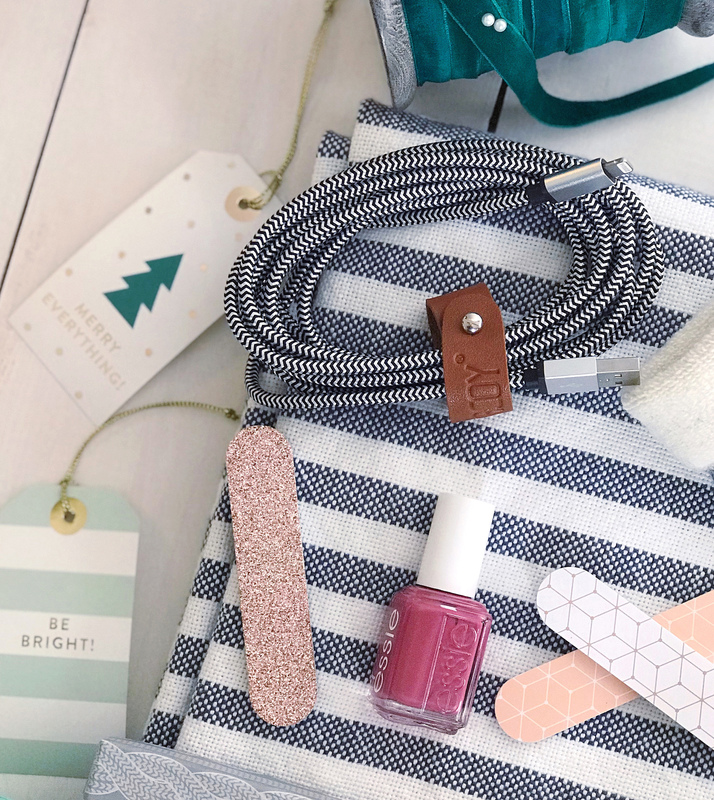 A little DIY spa kit is another good addition. I tucked in a pretty nail polish, some festive nail files, and face masks for couch-side facials. Sweet Sips. No judgment here if you want to pop a nice bottle of pinot noir for your day of couch lounging. Nothing is better than a glass of wine by the fireplace! I do find though that a cozy winter weekend at home is the only time of year where you get to indulge in hot cocoa topped with an obscene amount of marshmallows. 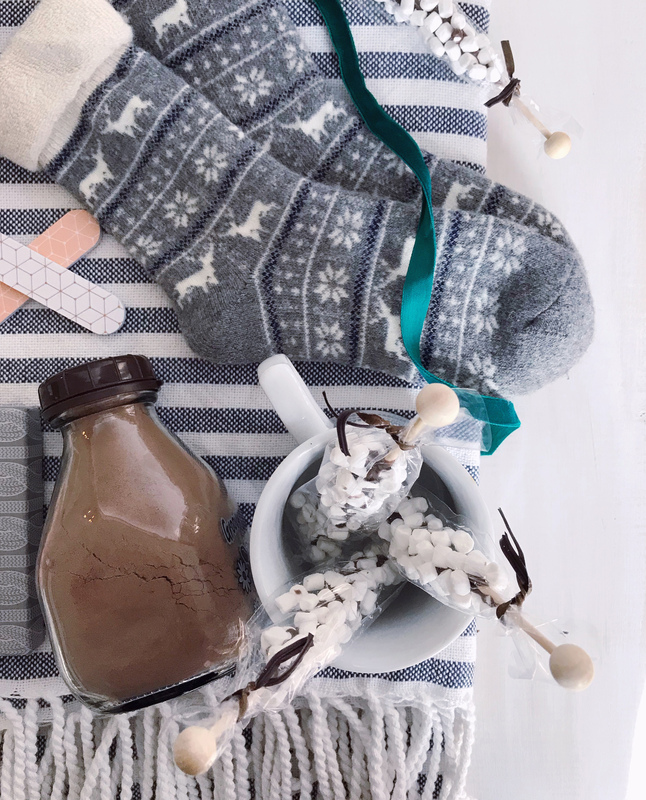 Finding a nice cocoa mix and some festive marshmallows, or marshmallow stir-sticks, is the perfect addition to the hibernation kit. 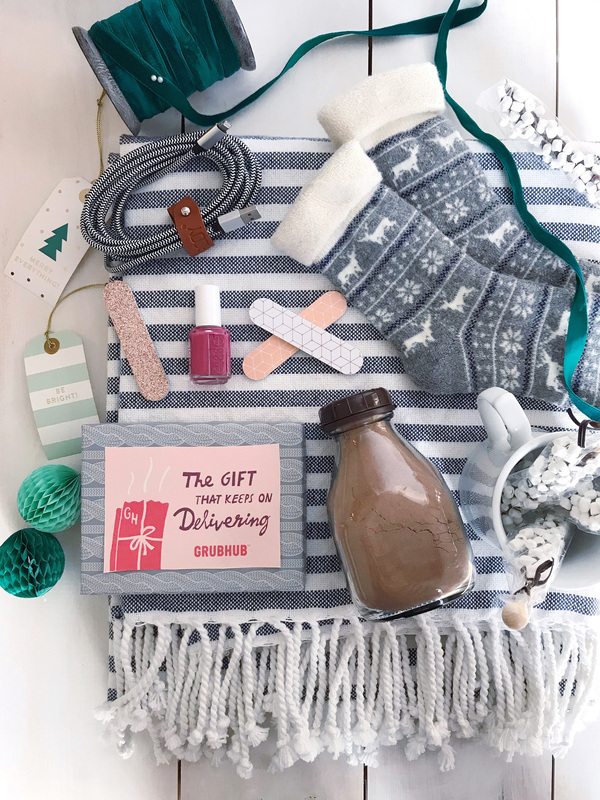 Wrap it all up in a basket and you’ve put together the most useful holiday gift for your sister, brother, best friend, cousin, or secret Santa! I wouldn’t mind receiving one, hint-hint! Please note: This post was created in partnership with Grubhub. All opinions, ideas and images are my own. Thank you, as always, for supporting brands that support this site! Holiday Coffee Bar and Snowman Sweet Treats. Pumpkin Muffins with Cinnamon Cream Cheese Frosting.